Mike Solomon – Mike Solomon's Blog on how the Mobile,Web and a "shift in thinking" is changing the media and work landscape – Forever!! Mike Solomon's Blog on how the Mobile,Web and a "shift in thinking" is changing the media and work landscape – Forever!! However, the nature of this blog is going to change. From around 2006 I have been fascinated by mobile – back then barely a whisper in the halls, now a full blown megaphone in everyone ear! What is it, how cant it help marketers and brands and what is best practive? Whats cool and whats not? Ill try and answer these as I go along. No iPhone in SA on 22 Aug? Dosent look like SA is being added to the mix on 22 Aug. Apparently 20 or so countries around the world have been confirmed to get the the iPhone on Fri 22 Aug, but NOT South Africa! So if not 22 Aug then when? Seems you can sign up to get one as soon as they land. However there’s still no word on when exactly it is coming (US/ Western Worlds release date is 11 July) or how much/ what the plans will be. Looks like it will also be available on pre paid which is cool. I just hope Vodacom introduce a decent flat rate data plan! Its official – the iPhone is coming to SA! Vodafone have signed an exclusive agreement to offer the iPhone in 10 markets incl good old South Africa! Click here and here for the official word! Lets just hope Vodacom come up with a decent data plan. Im also pretty sure it will be the 3G iPhone hopefully due in June! Finally! The company i work for has put together an awesome new reality series offering one lucky South African the chance to drive the official Renault F1 car around Silverstone while being filmed on TV for a reality show. The series is being sponsored by the Gauteng Provincial Government and the Renault F1 team. Its easy to enter – just go to any Renault Dealership country wide, fill in the supplied form, and if you make the grade, you’ll join other hopefulls in a series of challenges as the eventual winner is found! There will also be a driver training in France before the big drive. Yup its been ages since I did a blog post, but id rather blog when I want to say something rather than just for the hell of it. Anyway, in keeping with iPhone trend,I first purchased my iPhone when they were released last year. 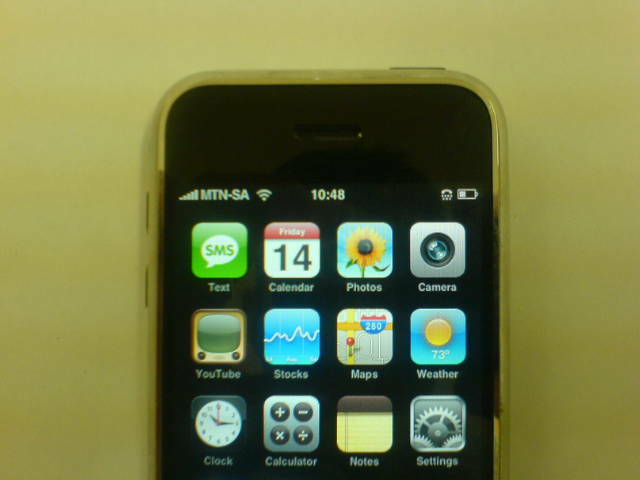 I had to wait about 2-3 months to crack it, and once cracked, the iPhone would not work on Vodacom for love or money. After hours on the phone to support desks and even a trip to Vodaworld, i had no choice but to port to MTN as in the pictures. I wasnt happy about this, but the phone worked fine. Now some good news – Yesterday I happened to put my Vodacom simcard in the phone on the off chance that it work and guess what? – it worked 100%. Vodacom must have changed a network setting or did an upgrade so the that the iPhone would work. This leads me to speculate that maybe, just maybe Vodacom are doing prelim tests to see if the iPhone will work before they bring it here? Maybe they are talking to Apple about bringing it here? Just speculation, but would it be nice!! First working iPhone in South Africa! Yup you guessed it – unless im wrong, this is the first working iPhone in SA! 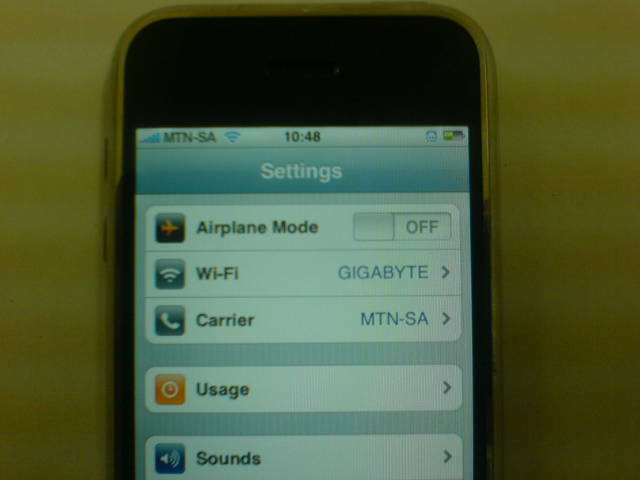 Im actually on Vodacom but having some minor issues – MTN works 100% though! Oh and for anyone wanting to know – iPhone is undoubtedly the best mobile phone out there. UPDATE: After using the iPhone fora few months now i am really enjoying it. Im still on the original firmware (1.0.2) but im going to upgrade. I have noticed a few issues which have come about, namely some dead blocks on the touch screen (which weren’t there before) and a sim failure error which i never got before. Im hoping a firmware upgrade will fix if i can get it to work. The things we do for Apple!! !